It is a one-day event during which you will learn more about the VIBOT – 3D Vision and Robotics Master program- and the collaborative opportunities that are offered to companies wishing to sponsor the program. You will also attend several oral and poster presentations given by newly graduated students that will raise your awareness of the academic excellence of the students as well as the high level of the courses taught in the program. Moreover, this one-day event will also be an opportunity for you to meet and discuss with past, current and future international students. If you are seeking collaborative opportunities and/or looking for outstanding and highly trained candidates prepared to face the challenges of today’s and tomorrow’s world then VIBOT Day is the right place. Do not miss this opportunity! VIBOT Day 2018 will be held at the Sala de Graus of Facultat de Lletres, Barri Vell Campus of the University of Girona, SPAIN, on 12th June, 2018. Proceedings of the work presented by students at the VIBOT Day will be downloaded here. Students will present their work done in the MSc thesis as a poster. There will be also oral presentations for the best six MSc thesis. In VIVA 2018 tab you will find information about all the MSc thesis. 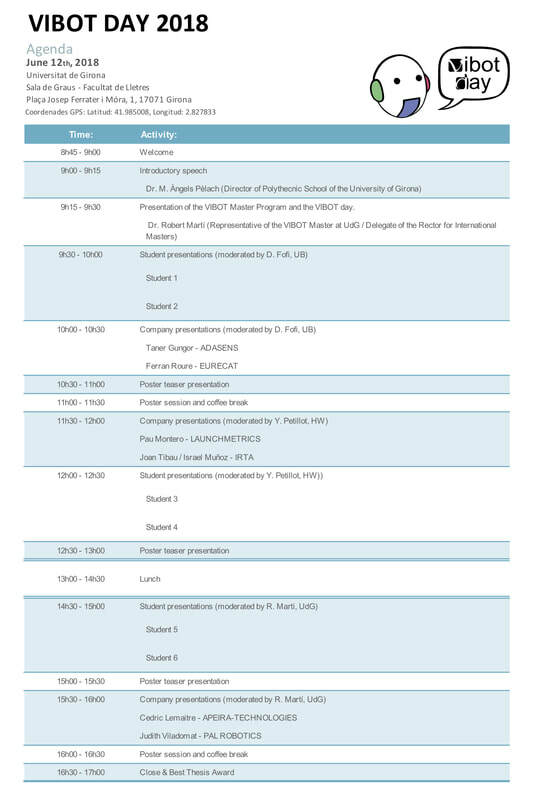 Here will be the programme of the VIBOT Day.